Before I was diagnosed with breast cancer, I dreamed that I had gained a new internal organ. It was called a “keen,” which afterward I thought might be a hybrid of my kidney and spleen. I didn’t know if it was intended to purify me of toxins, the task my kidney performs, or to serve some essential but unknown purpose as my spleen does, or merely to occupy a space, which would then be sensed as an absence should it be removed. I didn’t know what this organ “keen” was supposed to mean to me, how it was supposed to serve me. Was it a kind of anticipatory recompense for a loss I was yet intended to suffer? I knew only that I looked the word up in the dictionary and found that it is the word for the wail of grief for the dead, sung at Irish funerals. I also discovered that Audre Lorde wrote a poem, “Holographs,” a critique of South African apartheid, the second stanza of which begins: “60,000 Pondo women keening / on the mountain...” Each of its three stanzas ends with a question and a plaint on death and dying. The first on malnourished babies dying prematurely, the second on fathers going off to fight to their deaths, and the last on the imbrication of death and life. This is not the only time that Lorde expresses her pain as keening. Earlier she writes of the anger and hatred Black women feel against each other and themselves, which issues forth as a carnivorous keening, like the self-destructive she-wolf who chews off her paw to escape a trap. The keen may be that part of oneself that is sacrificed for survival. 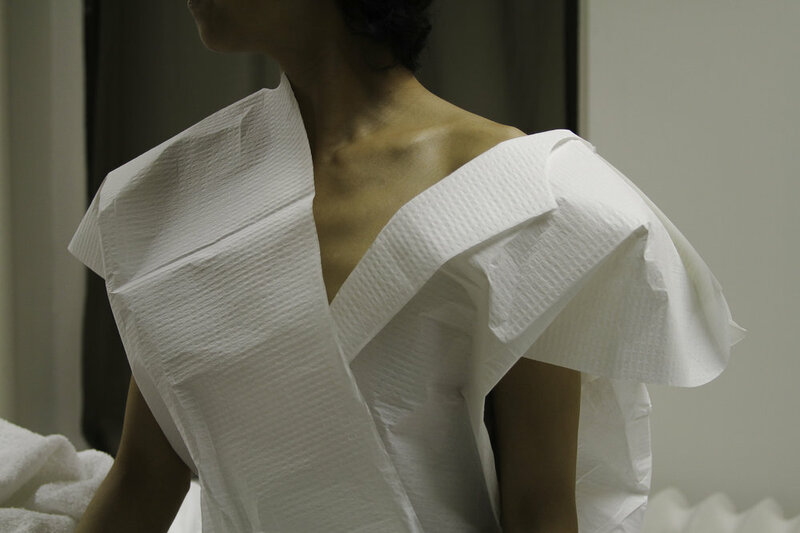 Paper robe. © H. Lan Thao Lam, 2017. 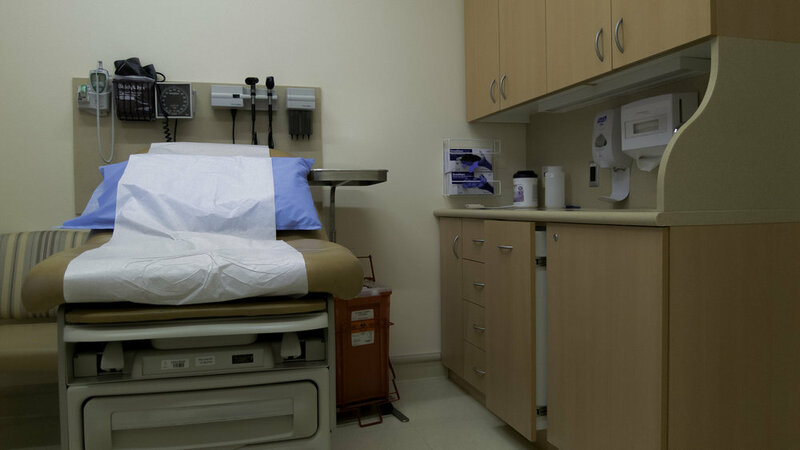 Clinical bench. © H. Lan Thao Lam, 2017. Acupuncture needle. © H. Lan Thao Lam, 2017. 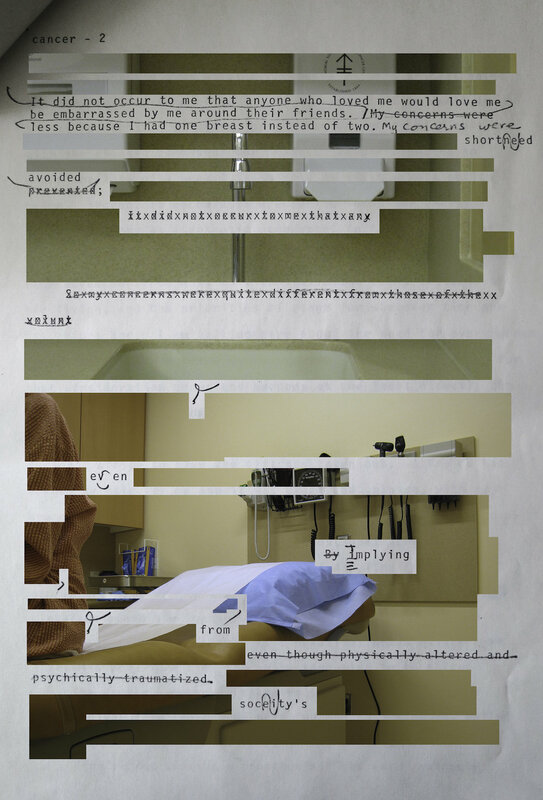 In the aftermath of my mastectomy, I asked myself how an artwork might respond to questions of bodily uncertainty, how art might react to bodily crisis. As an artist this was a predictable question for me to ask. Through her writing, Lorde thinks creatively and critically about the meaning of bodily absence, corporeal suffering, and defamiliarization. Her answer to my questions is to make creation of destruction. In a sense, she mobilizes the oscillation between destruction and creation, between death and life, putting death to use such that survival amounts to an insistence upon “not- death.” She does not try to imagine a world without pain and hardship. She tries to imagine a world that can make use of it. She tasked herself to create something new, something that did not seek to restore the past or fill the absences that remained in the wake of devastation. She used words to speak back to her losses. The German psychoanalyst, Melanie Klein, was also especially attuned to words. She proposed a word for the emotions bound up with losing the loved object. To represent the sorrow, concern, fear, and longing for the lost object Klein selects the word “pining.” We pine for the object we have lost and we mourn its loss through keening. Lorde’s longtime friend Adrienne Rich wrote a poem about a childhood friend of hers who had died of breast cancer, “A Woman Dead in Her Forties”: “we never spoke at your deathbed of your death / but from here on / I want more crazy mourning, more howl, more keening.” Rich’s verse bemoans the silence of death and calls for the reparative gestures of speech and mourning. It echoes the lament that Lorde hears from the South African mountaintop and the cry that she utters in miming the keening she-wolf. More than once Lorde turned to the keening she-wolf as a metaphor for the self-destruction that underlies survival for people, especially women, of color. I give myself language in naming an imaginary part of myself “keen.” My keen, like Lorde’s and Rich’s poetry, might be regarded as a creation that can be used for mourning absence, that symbolizes but does not substitute for the lost object. Lana Lin is Associate Professor of Film Theory and Digital Cinema at the New School in New York. 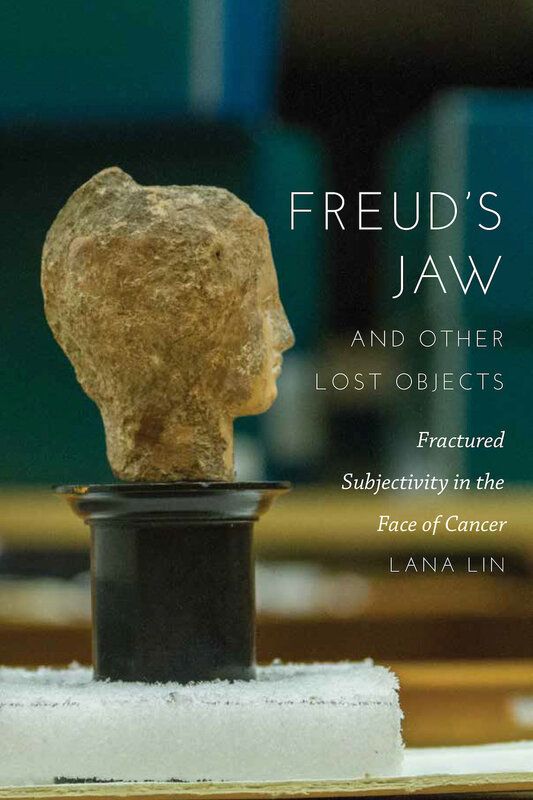 This lightly edited excerpt from Freud’s Jaw and Other Lost Objects: Fractured Subjectivity in the Face of Cancer (New York: Fordham University Press, 2017) comes toward the end of a chapter in which psychoanalyst Melanie Klein is put into conversation with poet Audre Lorde. Klein’s theories of the reparative impulse that emerges in the wake of the destruction of internal objects are brought to bear upon Lorde’s reflections on survival and mortality, which are prominently featured in her memoirs, The Cancer Journals (Argyle, N.Y.: Spinsters, Ink, 1980), A Burst of Light: Essays (Ithaca, N.Y.: Firebrand Books, 1988), as well as in her journals and poems. Banner image: Original box containing draft of The Cancer Journals, preserved in the condition of receipt at the Lesbian Herstory Archives, Brooklyn, New York. © Lin + Lam, 2017.